Local democrats did not like the Clinton-bashing protester at the McCaskill Rally in St. Louis on Saturday. So they tried to “edit” her out of sight! Just more of the same from the free speech crowd. 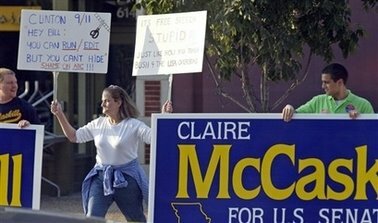 And, the story Claire McCaskill was hoping would just go away, about her outrageous comments against President Bush, was published in another Missouri paper and another one this weekend. McCaskill has still not apologized for her pathetic attack.